The good, the bad and the ugly. A mixed review of Euro Pizza Café. We’ve eaten breakfast there quite a few times as well as lunch. Usually we’re seated on the patio to enjoy the view of the lake and because we walk down from our house and take our dogs. First the good: I ordered the eggs Benedict. 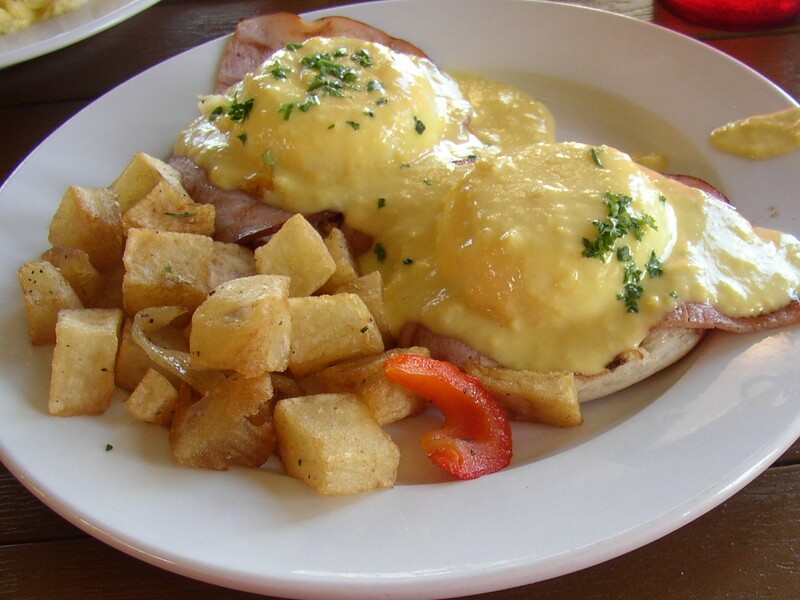 I love the way the tart hollandaise sauce melts over the rich yolks oozing out of the poached eggs, complemented by the salty ham and crunchy toasted English muffin. 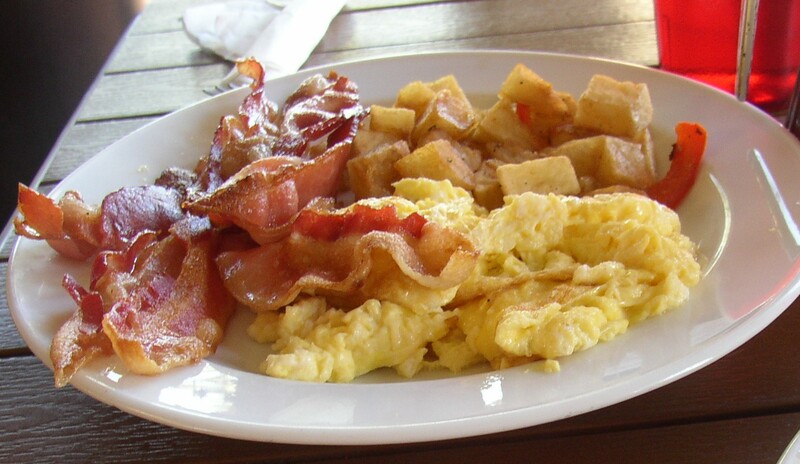 Brian had the delicious fluffy pancakes, crisp bacon and creamy scrambled eggs. Ask anyone who cooks, you can easily botch scrambled eggs and dry them out. He always enjoys the scrambled eggs at Euro Café. The potatoes served with both breakfasts were hot, crisp and well-seasoned. Rose, our Irish setter, especially enjoyed them. Kate, our English Springer, preferred the scrambled eggs. They get a few nibbles as a reward for behaving themselves. Now for the bad. The service on our previous visits had been fine. Today not so much. We had to wait an hour to get our food. And we weren’t the only ones. The guests on the tables around us were complaining. I don’t believe it was the wait staff’s fault, since there were six working and that should be adequate to cover the number of tables. I think the kitchen was backed up. Okay here’s the ugly. One of my eggs Benedict was nearly perfect, the other inedible, as the egg was still nearly raw. The white was clear towards the center and the yolk very runny. Eating raw eggs can be a health hazard. You may be asking yourself why I didn’t ask to talk to the manager or owner. I did and waited another 20 minutes. He or she never showed. I like Euro Pizza Café and I’m hoping today was an anomaly.